Improve the aesthetic and comfort of your home with wood look tile in Colorado Springs, CO. At The Floor Trader of Colorado Springs, we offer a number of great tile surfaces that mimic the look and feel of real hardwood. This lets you combine the high durability of ceramic and porcelain tiles while also adding the timeless aesthetic of natural wood. For centuries, tile has been a robust flooring solution for homeowners everywhere. This is thanks to the unrivaled resilience that tile provides for your floors. With wood plank porcelain tiles, you gain the benefits of this high resilience while also getting the beautiful appearance you want for your home. Tile offers a high level of moisture protection and wood look tile lets you add a wood look to rooms where natural hardwoods normally do not work, such as in bathrooms and basements. With a tile floor, you do not have to worry about it contracting and warping when it gets wet. The moisture protection also makes tile easier to clean with most spills wiping away quickly and not absorbing into the floor. Furthermore, wood plank ceramic tile is a great conductor of heat. This makes it a great choice to combine with in-floor heating to keep your feet warm even while barefoot in the winter. When you are remodeling your home with new floors, it is important to choose a surface that looks great and will last for years. With our wood tiles, meeting both of these criteria is a breeze. Our porcelain and ceramic wood tiles are available in a variety of patterns and colors, allowing you to choose the design that fits perfectly into your home’s current or planned décor. If you are unsure of what design aesthetic you are looking for, then our team is here to help. Our flooring experts will help you explore our vast collection of surfaces that we offer while also providing advice on which flooring options will work best for your remodeling goals. So whether you know exactly what aesthetic you are looking for, or need help coming up with a design, our team is always ready to help you find the floor you need. 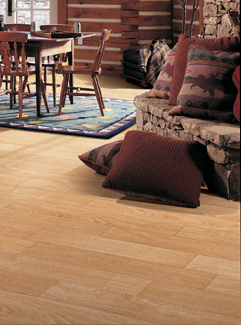 After choosing your new ceramic or porcelain wood tile floor, let our team take care of the installation. We have the experience and tools required to ensure everything is taken care of correctly and that your new surface looks as good in your home as it did in our showroom. Contact us when you are looking for a wood look surface for your home’s floors. We proudly serve Colorado Springs, Monument, Palmer Lake, Security, and Widefield, CO, as well as the surrounding areas.